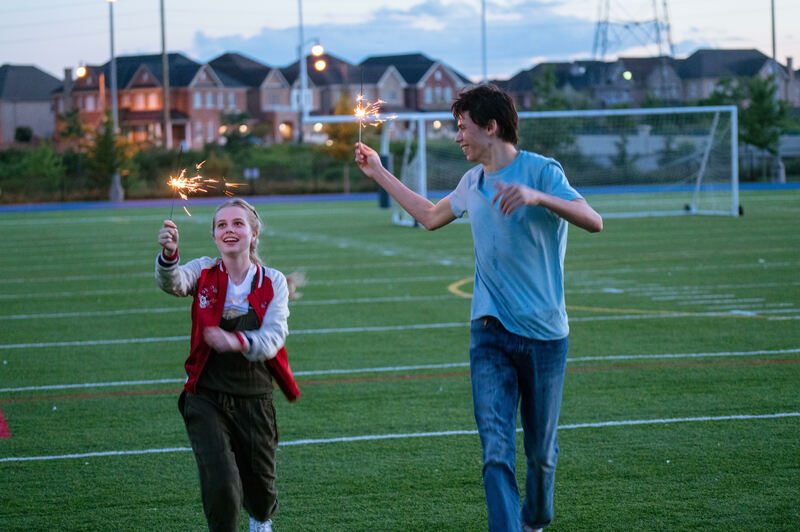 If you’ve seen the trailer for Every Day, you know it’s about a teenage girl who is in love with a soul who wakes up in a different body every day. That soul, named A, has never had a body or a family of their own. Instead, their life is a covert operation, and each day the mission is clear: Leave the life of the person whose body they’re inhabiting as undisturbed as possible. This works until A meets 16-year-old Rhiannon (Angourie Rice) while inhabiting her boyfriend’s body for the day, and they fall in love. The movie, which is in theaters this Friday, Feb. 23, is part fantasy, part teen drama and all love story. But if you’re not familiar with it, there are a few other things you probably don’t know. Ahead are three things to know about Every Day, whether you’ve seen the movie or want to see it. No major spoilers, promise. The love-is-love message behind Every Day may feel very now, but the story is from a 2012 YA novel written by David Levithan (Boy Meets Boy, Nick and Nora’s Infinite Playlist). And while it certainly makes the case that love is gender-blind, Levithan told Entertainment Weekly that his aim was not to make a statement about the gender binary or homosexuality. If you want to know more about A, Levithan wrote a prequel ebook titled Six Earlier Days. It takes you through six pre-Rhiannon days of A’s life, allowing you to learn more about the mysterious character. And if you want more Rhiannon, you’ll want to check out Another Day, also by Levithan. It’s pretty much the same story as Every Day, but while the novel is told from A’s point of view, Another Day is told from Rhiannon’s. Every Day has some similarities to the 2015 Korean movie The Beauty Inside, but The Beauty Inside is not the Korean version of Every Day and it’s not related to the book in any way. In fact, the only thing the two movies share is a body-hopping character who struggles with love and the overall message that love is love. But where A has never had a consistent body,Woo-jin — the protagonist in The Beauty Inside — lived the first 18 years of his life as a boy with friends and a family. Woo-jin retains that identity as he wakes up as different genders, ages and races, and he never knows anything about the bodies he inhabits. And while The Beauty Inside feels a rom-com, Every Day is ultimately a love story that’s hard to forget. Every Day is in theaters this Friday, Feb, 23. Check out the trailer here. This post was sponsored by Every Day.